Life Technologies launches Invitrogen Select, a publication alert aggregator. As we’ve talked about here, research publications are the ‘glue’ that tie life science researchers together, and LIFE is ingeniously tapping into this with it’s new Invitrogen Select website and service. Researchers can sign up for publication alerts in a variety of fields, and LIFE adds an unobtrusive text advertisement at the end of the publication titles. It’s a nice tool for researchers because it is difficult to set up Pubmed alerts which all appear in one email. How to build a social media cheat sheet for any topic. This is brilliant and self explanatory, I highly suggest doing it to become an expert on any life science topic and/or to generate content for your social media campaigns. If you don’t feel as though you have the time, check out our Custom RSS service, we can generate daily emails for you. Quora is a site everyone’s talking about, it is a ‘clearing house’ of questions and answers for any topic. It looks like it will be good for finding thought leaders/KOLs, information, and to establish yourself in an area. Looks like LinkedIn is launching a bunch of new search tools. This is hot off the presses, I haven’t had time to look into it, as always help yourself! LinkedIn is a treasure trove of information, having more access to it is bound to be very useful. 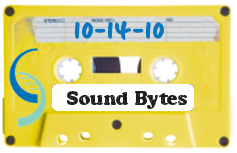 All links can be found under the soundbytes tag on Delicious, and sign up for Comprendia blog email updates to get our mix tapes delivered to your inbox.